Banks’ first novel, The Wasp Factory, was a surprise within a surprise–a well-written horror novel that was also a well-written “mainstream” novel. Since then, Banks has continued to surprise mainstream readers with surrealistic novels like Walking on Glass and The Bridge, as well as surprising science fiction readers with intelligent space opera like Consider Phelbas and The Player of Games (Banks’ space opera compares favorably with Hyperion by Dan Simmons). 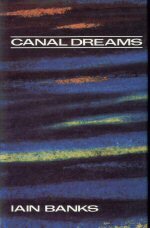 In Canal Dreams, Banks revisits the type of realistic horror found in The Wasp Factory. Hisako Onada is a Japanese cellist who refuses to fly, yet wishes to tour Europe. Her agent books her passage on a Japanese freighter, and she gets caught up in a revolution when her ship becomes trapped in the Panama Canal. That’s one part of the story. Another story line explores Hisako’s background, from the sacrifices that her mother makes early on as she makes it clear that she wishes to play the cello, through the very rigorous Japanese education process, to joining a major Japanese orchestra. The background serves as an important counterpoint to the other storyline, explaining that her refusal to fly is based on a true phobia. Banks is pointing out that phobias are irrational fears, that have no bearing on the bravery or bearing of the person. When the realtime storyline turns wicked, one isn’t surprised at Hisako’s actions or her ability to weather hardship. Banks’ horror is like Stephen King’s Firestarter without the pyrokinetics, or Thomas Harris’ Silence of the Lambs without the psychopaths. Canal Dreams is a novel about the kind of horror seen all too frequently in the news, and occurs even more frequently in the real world. And that is true horror. Next: A Canticle for Leibowitz, Walter M. Miller, Jr.